Figure 1. This 1.42 ct type IIb natural diamond was significant for its unusual Fancy gray-purple color and its strong emission at 776.4 nm under PL spectroscopy. Photo by Robison McMurtry. Photoluminescence (PL) spectroscopy using several laser excitations has become the most important method for determining diamond color origin. Part of PL analysis is observing peaks that correlate with a diamond’s color, type, or other gemological properties, but for which the physical model is still unknown. One such center is the PL peak at 776.4 nm, which is commonly observed in type IIb diamonds with intensely colored (i.e., Fancy to Fancy Deep) blue to gray color and in combination with red phosphorescence (S. Eaton-Magaña and R. Lu, “Phosphorescence in type IIb diamonds,” Diamond and Related Materials, Vol. 20, No. 7, 2011, pp. 983–989). Recently, the Carlsbad laboratory tested a 1.42 ct colored diamond that showed an extremely strong 776.4 nm emission. Infrared absorption spectroscopy confirmed the specimen as a type IIb natural diamond with a boron concentration of approximately 28 ppb. This stone was notable not only for this intense emission, but also for its Fancy gray-purple color (figure 1). This is an extremely rare combination in a type IIb diamond. 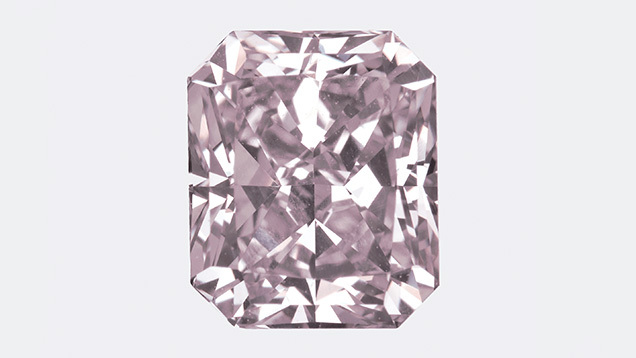 Type IIb diamonds sometimes have a violet color description, but they rarely exhibit hues that are outside the blue-gray-violet range. While the perceived difference between a violet and purple diamond may be quite subtle, it is an important distinction when determining color origin. An additional reddish component that distinguishes purple from violet diamonds is extremely rare among type IIb fancy color diamonds. Other type IIb hues include gray-green or yellowish green (e.g., Summer 2009 Lab Notes, p. 136; Spring 2012 Lab Notes, pp. 47–48). Purple diamonds are quite rare and almost exclusively type Ia, their color deriving from the 550 nm band observed in their visible absorption spectra (S. V. Titkov et al., “Natural-color purple diamonds from Siberia,” Spring 2008 G&G, pp. 56–64). This absorption band is also the cause of color for many pink to red diamonds; however, the absorption spectrum for this diamond was featureless within the visible range, which is typical for type IIb diamonds. This stone is likely the first purple type IIb diamond examined at GIA. Figure 2. With 514 nm excitation and liquid-nitrogen temperatures, the 776 nm PL peak dwarfs the diamond Raman peak at 552.4 nm and all other PL features in the spectrum. 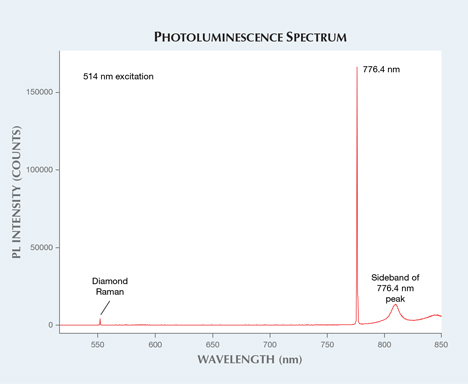 The intensity ratio between the 776 nm peak and the diamond Raman peak is about 42:1. The diamond had the strongest 776.4 nm PL emission yet observed by the author (figure 2). The configuration of the optical center is unknown but might include a boron-vacancy complex (T. Ardon and S. Eaton-Magaña, “Spatial distribution of boron and PL optical centers in type IIb diamond,” 2013 GSA Annual Meeting). Red phosphorescence, centered at 660 nm, was observed using DiamondView and excited by both ultraviolet and visible-light wavelengths using fluorescence spectroscopy. The 776.4 nm PL peak is observed when the diamond is at liquid-nitrogen temperatures, but it is outside the visible range and not excited at room temperature. Therefore, this near-infrared emission, while strong, does not contribute to the color of the diamond. The diamond’s red phosphorescence, while subtle, may have been sufficient to introduce enough reddish component to render a purple color call (as opposed to the more common blue to violet). The singular occurrence of the very strong 776.4 nm PL peak and an unusual bodycolor for a type IIb diamond make this stone notable. Sally Eaton-Magaña is a research scientist at GIA’s Carlsbad laboratory. Explore colored diamonds history, research, quality factors, and more in the GIA Gem Encyclopedia. Twelve natural-color purple diamond crystals from Siberia were studied using spectroscopic methods to better understand their color and its causes.